Semtech Corporation (Nasdaq: SMTC), a leading supplier of analog and mixed-signal semiconductors, announced that its LoRa® wireless RF technology for Internet of Things (IoT) applications was used in the winning solution at the Campus Party Mexico Hackathon in Zapopan, Jalisco, Mexico on June 27-July 1. Team Brainiacs presented its Nodi solution, which is based on LoRa wireless technology, for enabling affordable and easy-to-use text communication in remote communities. Brainiac’s solution uses a network of LoRaWAN™ sensors to enable a solar-powered mobile device that communicates via text on an unlicensed frequency. This should give remote communities easy, free access to communication that can serve health, education, public safety, financial, environmental protection, income generation and employment, and other critical purposes. 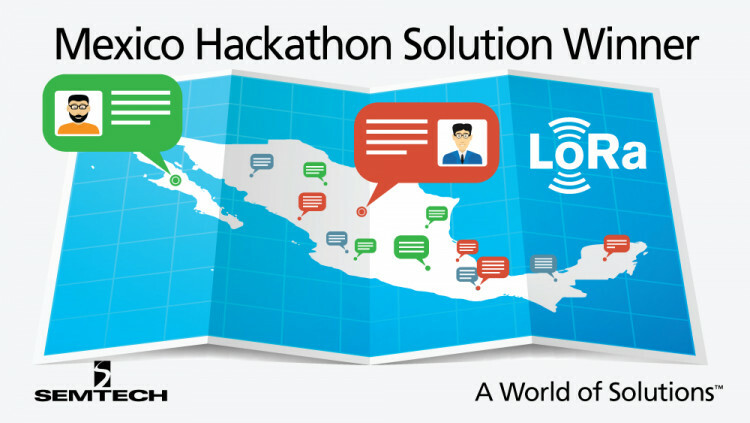 The Campus Party Mexico Hackathon aimed at combating poverty at this year’s hackathon and received over 265 viable proposals from among 20,000 attendees, which broke a Guinness World Record. Members of the Brainiacs team were already in contact with Semtech through a series of LoRa workshops hosted in cooperation with FUMEC. Now that the team has additional prize funding, they can expand their operations and create more prototypes. In addition to winning one million pesos, the team will receive expert advice to help start and grow their company. “We endeavor to promote projects with a global impact. The Brainiacs project represents an example of the support that FUMEC provides to startups and companies to implement innovative technologies such as LORA creative Internet of Things (IoT) applications not just in Mexico but throughout the world,” said Guillermina Avendaño, Director of Microsystem Programs at FUMEC. Semtech’s LoRa two-way wireless technology is a comprehensive solution for low power, long-range connectivity, which is essential for LPWANs supporting IoT applications. It offers deep penetrability, secure connectivity, long battery lifetime and streamlined implementation for simple network rollout, as well as integration into existing infrastructure. The United States - Mexico Foundation for Science (FUMEC) is a binational nonprofit organization created in 1993 in conjunction with the North American Free Agreement (NAFTA). FUMEC promotes economic development based on Science, Technology and Innovation in Mexico and encourages the adoption of new technologies by Mexican companies. For more information, visit www.fumec.org. All statements contained herein that are not statements of historical fact, including statements that use the words “aimed at,” “enable,””should,” “offers,” or “to implement,” or other similar words or expressions, that describe Semtech Corporation’s or its management’s future plans, objectives or goals are “forward-looking statements” and are made pursuant to the Safe-Harbor provisions of the Private Securities Litigation Reform Act of 1995, as amended. Such forward-looking statements involve known and unknown risks, uncertainties and other factors that could cause the actual results of Semtech Corporation to be materially different from the historical results and/or from any future results or outcomes expressed or implied by such forward-looking statements. Such factors are further addressed in Semtech Corporation’s annual and quarterly reports, and in other documents or reports, filed with the Securities and Exchange Commission (www.sec.gov) including, without limitation, information under the captions “Management's Discussion and Analysis of Financial Condition and Results of Operations” and “Risk Factors”. Semtech Corporation assumes no obligation to update any forward-looking statements in order to reflect events or circumstances that may arise after the date of this release, except as required by law.